For those of you who have complained that science has “ruined dinosaurs” by revealing that they had feathers, take heart. Many theropod dinosaurs did indeed have feathers, but a new study has found that Tyrannosaurus, and many other large carnivores of the Cretaceous, were likely covered only in scales. The findings suggest a relationship between the presence of feathers and the predisposition to large body size known as gigantism, Bell said in an interview. “What we found is that, as a group, tyrannosaurs got big twice in their history: once early on in in the Cretaceous, in the form of Yutyrannus, and another later episode starting around 110 million years ago in the lead up to T. rex and its kin,” Bell said in an interview. “The weird thing is that they did it differently. “Yutryannus did it with feathers, and T. rex and his lot dropped the feathers in favor of scales. “We were fortunate enough to study every known tyrannosaurid that preserves skin — in all, just five dinosaurs,” Bell said. 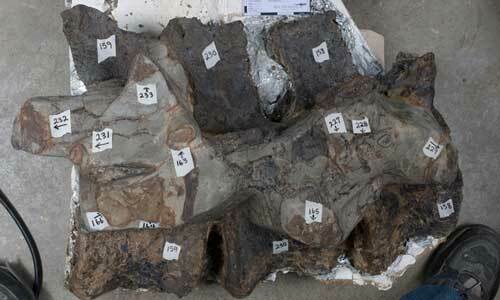 The specimens included a Tyrannosaurus rex from Montana, whose remains included fossilized skin from around the neck, pelvis, and tail. Samples from other fossils — of Daspletosaurus, Albertosaurus, and Gorgosaurus — were from the same parts of the body, as well as the abdomen, all parts where feathered dinosaurs sported their fuzz. Such dinosaur fluff can be relatively easy to spot, Bell noted. “They’re usually single strands, like the hair on your head,” Bell said of the feather filaments that have been found in other, earlier tyrannosaurs. But all the North American samples turned out to be completely free of feathers or any filament-like structures. The new study was not based solely on observations of fossils, however. Bell and his team used data from seven tyrannosaurs found in both Asia and North America to develop a statistical model, and then applied that information to a larger dataset representing the entire tyrannosaurid family tree. This then allowed the scientists to predict the presence of feathers throughout the evolutionary history of tyrannosaurids. “The model takes the presence or absence of a feature — in this case, feathers — and maps it onto the family tree of tyrannosaurs,” Bell explained. “Presence or absence can only be determined from fossils, so there are obviously missing data, but we know of several tyrannosauroids that have feathers, and now quite a number that had scales. The model finds that only after tyrannosaurs reached what’s now North America and began their second growth spurt, they lost their feathers. Why the fuzzy features disappeared remains unclear, Bell said. It could be a function of the climate in which the later, larger tyrannosaurs lived. Or it could have to do with the unique physiology that comes with having a body that’s 12 meters long. “There are too many things we just don’t know, but obviously feathers and scales do different things, so there was a need in each of these groups that feathers or scales had to fulfill,” Bell said. “What we can say is that getting big didn’t necessitate one or the other. “Possibly the loss of feathers is related to gigantism; big animals have trouble shedding excess heat, so having feathers is not a good idea, because they are good insulators. 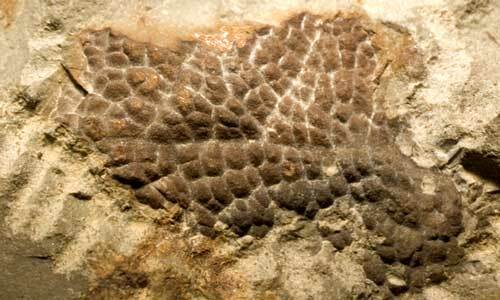 If nothing else, Bell says his team’s new research may draw attention to the rare but often overlooked aspects of fossilized skin, a bit of tissue that can reveal much more than just what extinct dinosaurs looked like. “For me, I think dinosaur skin is absolutely fascinating,” Bell said. “We’ve known about it for 150 years, but hardly anyone has paid it any attention. “It really paints a picture of what these animals actually looked like. “The discovery of dinosaurs with feathers was a real turning point, but we need to be careful about making sweeping generalizations about any one group. Plus, maybe we can all enjoy Jurassic Park again, without having to worry about its flaws. Bell and his team report their findings today in the journal Biology Letters.